I have a new hobby - shopping for clothes at thrift stores. Okay, maybe it's more a past-time than a hobby but it's something I really enjoy. When I was in Atlanta a few weeks ago, my mom, my husband and I made a day of thrift store shopping. 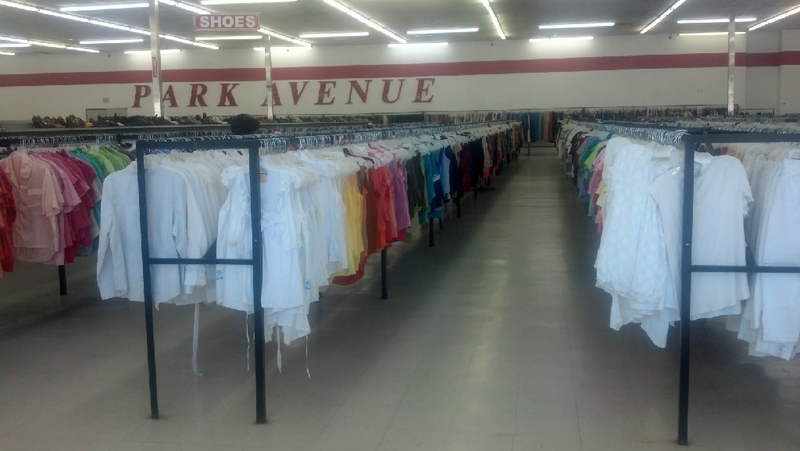 We hit two Park Avenue Thrift Store outlets (Woodstock and Lawrenceville) and a Park Avenue Thrift Store (Lawrenceville). We made a day of it, taking our lunch with us, and only making it back to mom's house in time for a late dinner. So what makes thrift store shopping so much fun? Let me tell you. 1. The prices. The outlets are the best when it comes to prices. At the Woodstock outlet, everything is $1.25 on Mondays, the day we went, while everything was $1.00 at the Lawrenceville outlet. Do you know what that means? I found four outfits, including two two-piece skirt sets, and spent less than five dollars total. Mom found considerably more yet spent less than $20. The funny thing is that my mom and I both balked at the high prices we faced that day. Why? Because had we shopped on Wednesday instead of Monday, we would have paid about half as much since the prices would have been 50 cents. And that's 50 cents per outfit, not fifty cents per piece. A shirt is 50 cents and so is a three-piece suit. Unbelievable! 2. Quality clothes. If you have some time on your hands, you can find some quality pieces. I get a big treat out of going through racks and racks of clothes, and making incredible finds. One such find was a gorgeous, navy blue Jones New York suit. Even after adding in the cost of dry cleaning, you still can't beat the price. 3. Guilt-free shopping. My mom and I started weight loss journeys a year or so ago. When you're losing weight, you really don't want to spend a lot of money on clothes. Why should you when you hope to be going down in size in pretty short order? Thrift stores allow you to shop while you're losing weight rather than waiting until you get to your perfect size. 4. Helping others. Thrift stores are oftentimes affiliated with homeless and/or battered women's shelters, group homes for kids, and the like. The monies taken in from the store sales go to support the shelters/homes and their residents. Further, the clothing found in most thrift stores are donated. As mom and I lost weight and our clothes became too big for us, we often donated them to various thrift stores and charities. These stores sell some of the clothes while others are given directly to the residents they serve. There was a time when I couldn't imagine wearing clothes that someone I didn't know had worn, but those days are long gone. I know the care I've taken of the clothes I donate and realize that the same heart goes into the donations of others. So what do you think of thrift store shopping? I'm eager to hear about your recent discoveries and great finds. I am a thrift store junkie, Angela! And count me in on Estate sales and Church or organization fundraiser Rummage sales! I never know what I'm going to find! I love shopping at thrift stores! =) You can find such bargains! Lyn and Melissa, It's nice to be around like-minded women! All hail the thrift store junkies! In the UK we don't have thrift stores that look anything like the ones you have. Ours are much smaller and less tidy. I think we could learn a thing or two from the US stores! I love thrift store treasure hunting!